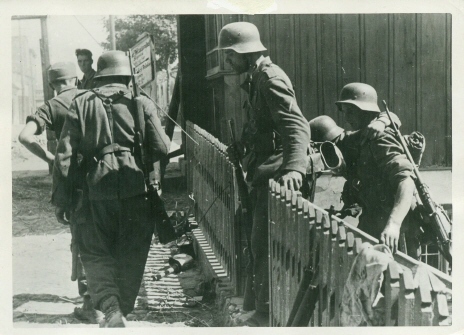 Here is another of the famous photos from the Sniper training school in Doberitz, Elsgrund from October 1943. this is a view which few enemy troops saw of the G43 sniper and lived to tell about! From the German Sniper 1914-1945 by Peter Senich page 338. 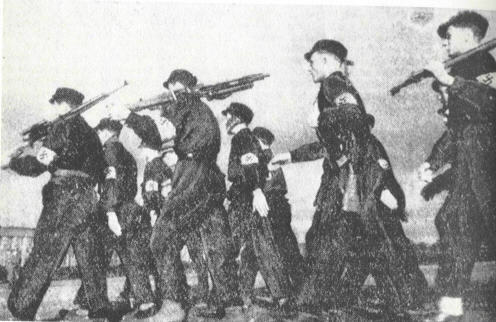 A very late photo showing Hitler Jugend carrying a variety of front line weaponry including a telescopically sighted K43, an StG44, and Mg42! From the German Sniper 1914-1945 by Peter Senich page 362.
the following images are credited to Darrin Weaver, Hitler's Garands pages xxvi, 96, 115, 116, 117. 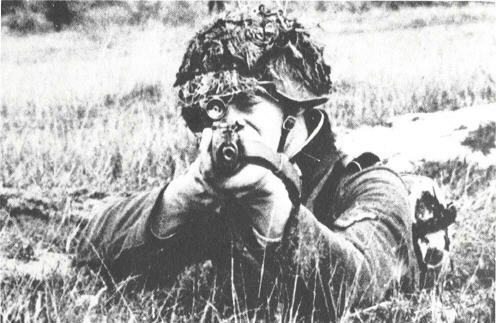 In this image, a German NCO prepares to fire his Walther G43 with milled away scope rail from behind cover in Warsaw, 1944. 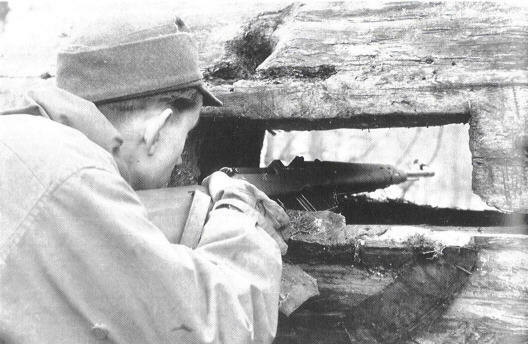 Here we find a soldier in Russia, 1944 readying his rifle in a bunker. The gun appears to be a Walther made example, note the lack of a takedown catch and un-notched scope rail from this "reclaimed" reciever ! 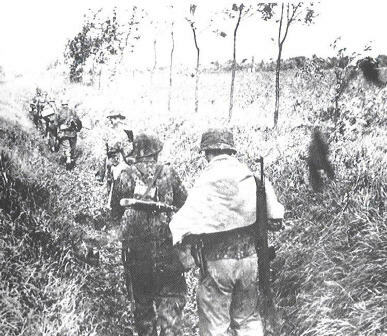 Here we fall in behind a retreating column of SS. the last soldat in the column has a new G/K43. Here we see yet another photo of the 3rd FJD FJR9 on one of Peiper's King Tigers in the Ardennes. 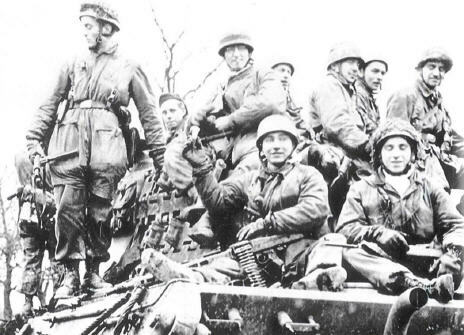 Dated December 1944. we see the Fallschirm soldat sitting at the bottom right with a G43 in his lap! 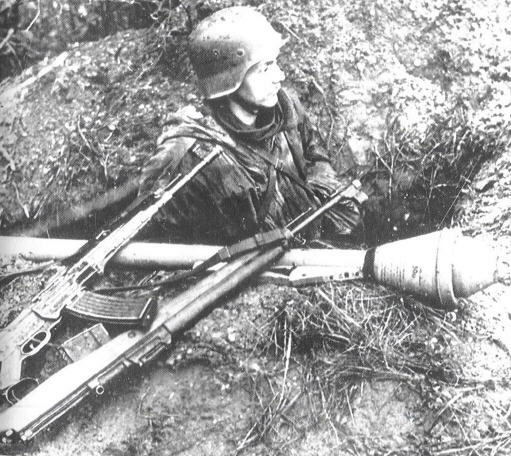 Here is a stunning photo of an extremely well armed troop in the infamous Hurtgen forest December 1944. He is not a fellow whom I would like to mess with! 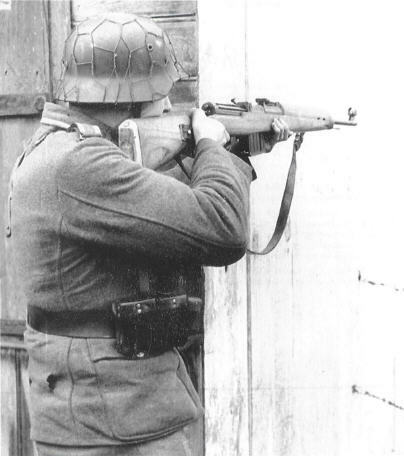 note his BLM G43, StG44, and PanzerFaust!